Store an image as a BLOB field in an Access database using VBA and ActiveX control csXImage. The Access database file is supplied in a choice of formats, the older .mdb and the newer .accdb format. csXImage includes two methods, ReadBinary2 and WriteBinary, which can be used to store and retrieve images as a sequence of bytes. This sequence will depend on the file format that is chosen, e.g., BMP, JPEG etc. Any of the file formats supported by csXImage can be used. In an Access database, the data type of a field can be set to "OLE Object". This data type can be used to store any kind of data, and when used with ReadBinary2 and WriteBinary, it will store images. The demo Access database includes a form called 'ImageForm'. This form allows a user to step through the images contained in the database. A screenshot of the form is shown below. This form includes several command buttons, each of which runs VBA code. 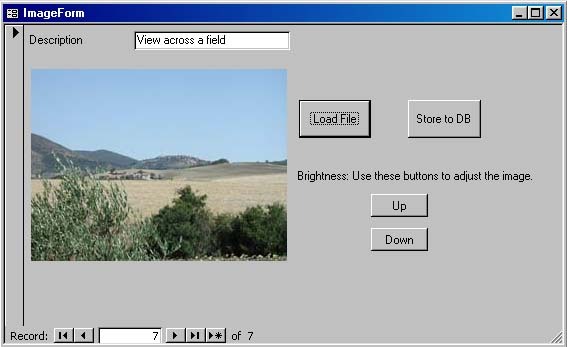 The 'Load File' button displays a dialogue allowing the user to browse for an image file to open. Any image file in a format supported by csXImage can be loaded onto the form. After an image is loaded from file, the 'Store to DB' button stores the image into the current database record. The WriteBinary method is used to do this. Two command buttons are also provided to allow the brightness of the image to be adjusted up or down, before storing to the database. This is an example of how the many functions available in csXImage can be incorporated into an Access application.